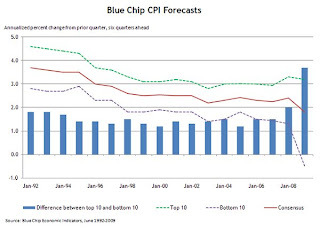 In the latest survey of the Blue Chip panel, the difference between the 10 highest and the 10 lowest inflation predictions for the fourth quarter of 2010 was a gaping 3.7 percentage points (compared with an average of about 1.5 percentage points over the past decade and a half). This wide range of opinions about inflation prospects started to emerge last year as economic conditions deteriorated. Exactly one year ago to this day, on July 11, 2008, crude oil futures reached an all-time high of $147.90. In that same month, world crude oil production achieved a record 74.8 million barrels per day. Much has happened since and in the wake of the financial crisis, crude oil prices tumbled to a low of $35 just before the end of the 2008. We will go into a more detailed analysis of oil price movements in an upcoming newsletter; in the meantime, please enjoy this remarkable example of boom/bust price action and celebrate the fact that we are far away from that peak-oil price. The Wall Street Journal Blog had a nice visual presentation of the increasing Federal Reserve balance sheet. Interesting to note here that until the end of 2007, over 90% of the Fed’s balance sheet consisted of US treasury securities. Things have changed dramatically since and the Fed’s balance sheet almost tripled at some point. It is currently just below $2 trillion, still far above anything imaginable by proponents of “free” markets. One must also wonder exactly how some of these assets are valued: Marked to market, or marked to myth? During this week’s G8 meeting, various voices have been heard about the current and future role of the US$ as a global reserve currency. While there are ongoing concerns, particularly from China (Reservations about the dollar & China attacks dollar’s dominance ) about the massive US government deficit and the Fed’s monetary policy, it has become increasingly clear that, in the short term, there is no real substitute for the Greenback’s status as the main reserve currency (Japan backs dollar as reserve currency). It should also be noted that both Japan and China have a vested interested in the Greenback’s future viability. The two countries are the largest holders of US treasuries. Please consider the following articles: Follow the Herd? Or Reason? and Cash Best as Record Correlation Hints Herd Collapse. Take note of the fact that correlation between various markets and asset classes has been increasing to levels not seen in decades. And, the tendency of the total aggregate of all investors (the herd) to have very similar investment preferences poses a potentially huge risk management dilemma. As Kieran Osborne notes “what happens when the herd gets it wrong?” We have seen what happens last year. 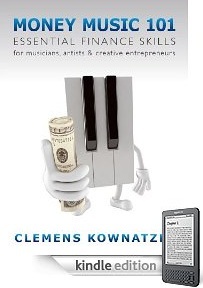 Given that everyone has (or soon will have) access to the same real-time information and given that capital can essentially flow freely to chase after any potential investment opportunity and, if everyone believes in the aforementioned investment mantras, consequentially, all portfolios should be nearly identical. But if, on aggregate, every single participant of the global market is fully diversified, in more or less the same way, is anyone? To help you ponder, here is a previous example used to show how ineffective diversification can be when “the herd” gets going.